mmmmm cheese. We made a 2nd batch of gouda...because we ate the first 4 lbs in 2 weeks. Our white cheddar will be ready around valentine's day (for mild) and we freaking can't wait. We might hold off until Easter for medium cheddar. I'm seriously drooling over the wait. It is killing me! Then there's the emmental, and then the other gouda will be ready. And our annato just arrived, so now we can make true orange cheddar! woot! I need a goat. An unlimited supply of milk would really help this new hobby to not be so expensive. Maybe Kasey's neighbors aren't as mean as mine. Let's pressure her into keeping it in her backyard. I'll come milk it. You can come for the cheese. These brownies sound amazing. I may just have to indulge. Oooohhhh noooo...chocolate and cheese,my fav treats.Even I mainly try to avoid them, sometimes it is just not possible.Luckily I am the only one in my house loving cheese so,it is easier to avoid that one then chocolate (with 2 kids around). Ice cream or gelato is my indulgence of choice. Or anything with cinnamon or caramel. Ahhh.... Something I should not be day dreaming about at nine am. I've become more enthusiastic about baking in the last year, but I usually make small-size cakes and small batches of brownies or cookies - enough for just me and my husband to share for a couple of days. can you believe meg hasn't invited me to try any of that cheese? what??? anyway, yum. yum. and yum. we have been throwing goat cheese on everything lately from salad, to eggs, to potatoes. i need to try this Manchego. Just did some late night baking, and while I usually fail at making brownies, these were amazing. Thanks for the recipe. Cheese and chocolate are my 2 favorite food groups!!! I mean, foods. We live a similar lifestyle, super healthy the majority of the time. 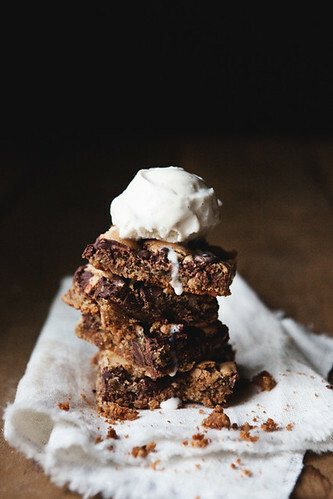 Mainly because I want to save room for desserts, ESPECIALLY if there's brown butter involved, yum! 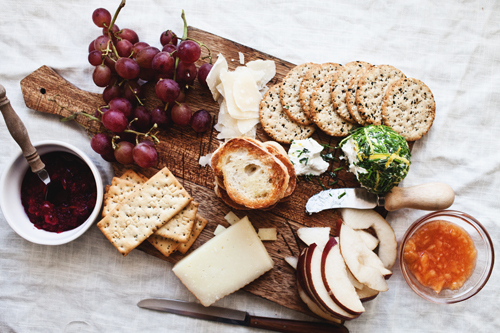 wow, that cheese plate is gorgeous, that is one of my favorite combinations. this is unrelated, and i hope you don't mind my asking, but i'm wondering what kind of product you use for your hair. thank you so much! ...just found your blog, your photos are amazing. I'm looking forward to trying a few recipes! you really need to come and visit Switzerland! haha! MMM... so delicious! Just made the blondies and they're a real hit with my whole family. We're thinking of experimenting with some chai flavorings next :) Thanks for sharing!